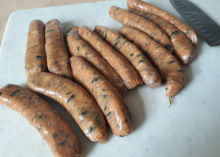 Yes, Yes OK we know we've said things like "whatever you do, avoid the novelty sausage" however these "Roulette" sausages from The Churchgate Sausage Company are proper grown up fun and a very well made product all the same, so trust us! 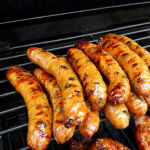 Having tried a couple of packs at a BBQ here at Sausage Review HQ with friends and family, the anticipation on faces as guests tentatively select "their choice" in turn, then find they are "safe" with the mild chilli sausage after all...but the look on the unfortunate that picked the sausage loaded with hot chilli is simply rip-roaringly amusing for the onlookers! 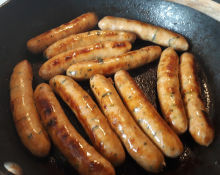 Churchgate make some top notch sausage product from their premises at Mayfield Farm near Sheering in Essex, and it's the consistency of production that draws us back time and time again. 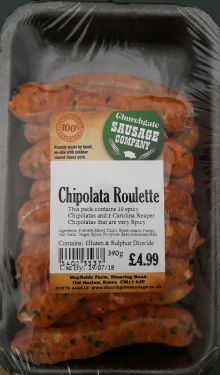 These chilli roulette chipolatas yes are fun but they are no joke and you won't be disappointed as they are made to the same quality as the mainstream product that Churchgate is well known for locally. 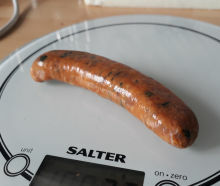 80% pork in natural skins minced well but not so fine that the texture is lost but enough as chipolatas should be. They cook up beautifully and are right "snappy" when you bite them! The "mixed chilli" used for the majority of each pack is not too hot and these on their own are a real good flavour, however the hot ones in the pack are loaded with CAROLINA REAPER chilli. For the less aware about chilli, Carolina Reaper's chilli heat is VERY HOT! Measured on a scale called the Scoville, these chillis come in at around 2 million and are one of the hottest recorded. OK there's not whole chillis in each sausage, but certainly just sufficient is in the mix to provide a kicker to "wake you up"! In each pack of 12 there will be 2 of the hot ones, and as you'll see from the photos, the whole pack looks much the same and even when closely inspected, we doubt whether you'll be able frankly to spot the difference between them. Even the aroma before and after cooking, won't give you a clue either. However when you bite in to a hot one, you'll know about it! Odd thing is the guests that didn't get the hot one still want to try one, just say that they have! This product is a particularly popular item, so on a sunny, fun BBQ afternoon with friends, family, and a few beers, why not join in and take the Chilli Roulette Challenge! Would we buy some again...we already have! 110x20mm before cooking, 95x20mm after. 32g before cooking, 27g after.